what’s up with s.o.s. p.v. We’ve been busy getting our hands dirty in the Pioneer Valley, but I cleaned up enough for Sunday supper to write a blog post without soiling the computer. After a dry March and April, those April showers finally showed up in May. That means the past two weeks have seen a lot of growth in our various growing spots in Franklin County. The seeds that would barely germinate are now growing too quick for us to keep up with. -The Summer Workshop Series is taking shape. Advisory Groups in Turners Falls have provided feedback, totaling about 26 workshops that the Brick House will attempt to put on this summer. SoS-ers will be in volunteer roles, facilitating some courses and also doing outreach and logistics. The free workshops will range from wilderness skills to English conversation practice to Kids Gardening. -Several rows are planted at Harvest Moon Farm and more are in the works. Our first SoS workday on Wednesday May 30 had six of us out transplanting tomatoes, spreading mulch, weeding and harvesting scapes! 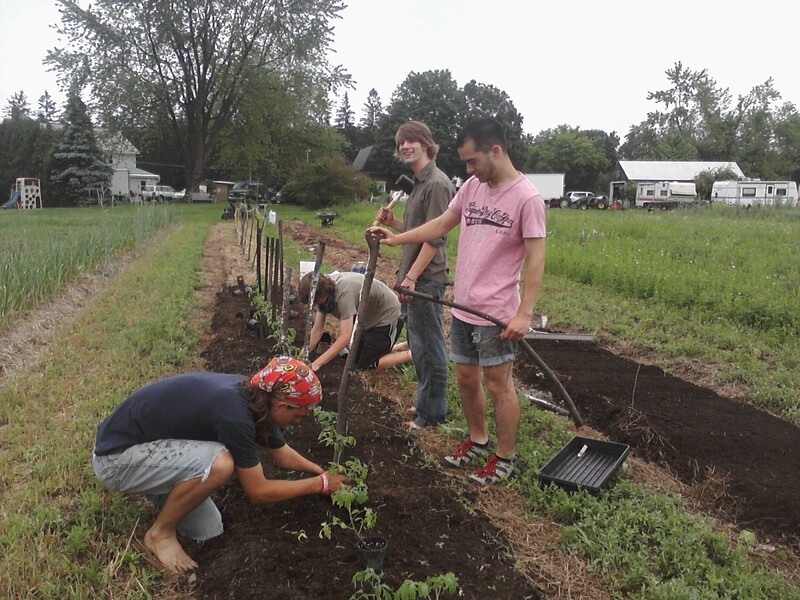 -We have gotten a lot of great farm donations that will keep us busy filling in the rows. Plants from Gwen’s work, transplants from Harvest Farm of Whatley, and seeds on the way soon from High Mowing and America the Beautiful. Always plenty of mulch from the farm too! -We took first place in the Youth Biz Expo Biz Idea contest with our Garlic Scape Pesto concept! We are now rushing to get ready to go into production, because the scapes are coming in early this year. Once we get a batch out, we now have many local contacts interested in purchasing. In the meantime, we have very stinky breath from snacking on scapes. -Program members have also made it out to Laughing Dog Farm in Gill and Warner Farm in Sunderland to diversify our agricultural experiences. Replete with goats and veggies, Laughing Dog is always a hit, and Warner Farm certainly gave us a lesson in tomato suckering. And all this even before the program starts? There’s no slowing down from here and we’re excited to kick off in one week with all our participants! Keep up with our adventures this summer at http://pioneervalleysolutions.wordpress.com/. Reblogged this on Pioneer Valley Summer of Solutions.